What are your priorities at the card show, when you only have $10 and change to spend during your time? If you can, you want to spend $4-$6 on one card [game used/autograph] of a fan favorite or prospect for example. 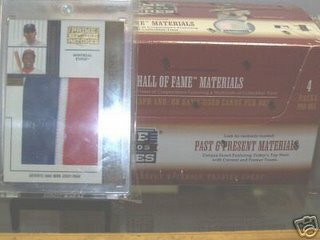 Still, at a card show, it is hard to find something cheap and good when there are only a limited number of booths with so-called bargain bins you can sift through. Also the price is usually a few bucks more than you’d be willing to pay on cards that are basically given away. If it there was a particular card you wanted, you may pay a small premium [if you consider the plight of the guy at the booth], but usually there is usually nothing compelling about many cards that you may see. You maybe better of saving that $4-$6 to spend on collecting supplies such as plastic sheets, boxes, top loaders, et al. Maybe a few packs of cards as well. If you can’t find what you are looking for, you end up settling for cheaper ‘fence busters’ found in the $1 and under bin. That maybe fun, but you need to be careful that what you pick up isn’t getting even more redundant because of the sheer number of cards you already have at home. You have to be creative, knowing that when you have a nickel-and-dime budget, you aren’t going to pick something that is going to be particularly valuable – just something to bide your time. 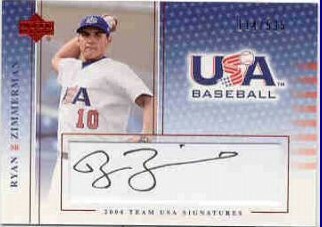 2005 Upper Deck Team USA Ryan Zimmerman auto numbered 26 out of 595 [$15.92 plus $2.50 s/h from Ebay]. I put in a two second snipe and won this card, which is apparently the most common version of his certified autograph from the set. This is where I dabble in prospecting - a cursory pick up of a guy who isn't a secret anymore. Zimmerman is on the fast track - a guy who has actually had a cup of coffee with the Washington Nationals in 2005 after he was drafted and is expected to be their regular third baseman in 2006 after the team traded away Vinny Castilla. The scan is not my actual card, but the one the seller used in the auction that I had won. 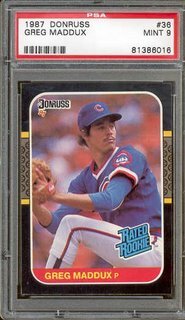 1987 Donruss Greg Maddux PSA-9 [$9.99 plus $3.50 s/h from Ebay]. It is funny that most the mainstream cards I clamored for back in the day aren't worth much anymore and I don't have to have a millionaire's budget to recapture my nostalgia. 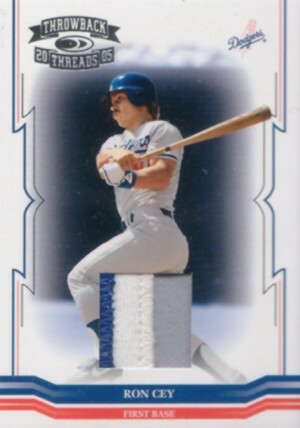 I bought a copy of this card for $6 in the early '90s, but it was off-center. This one is a more attractive copy, though the value has softened over time. 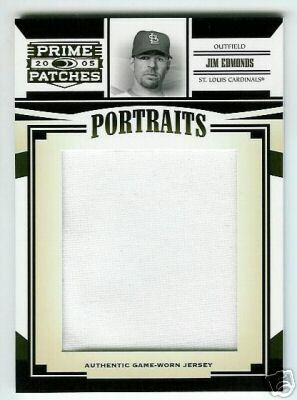 Still it is nice having a rookie card of one of the best pitchers of his generation, whether it is worth $50 or $5. 2005 Donruss Throwback Threads Ron Cey patch #'d 20/25 [$2.99 plus $2.50 s/h from Ebay seller: snwman8]. Alex Rodriguez (American League) - I think when you play for the New York Yankees, individual achievements mean nothing when you don't win a championship. Still ARod's anemic playoff stats don't matter. Love him or hate him for his contract, playing in New York or the slap, ARod was pretty darn good in 2005. 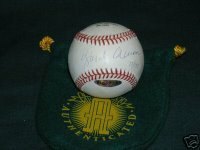 Albert Pujols (National League) - I would have liked to see Andruw Jones win, just so that the certified autograph I bought before the 2005 season started would mean something towards my award winners collection. I think Pujols was another sentimental [and probably deserving] favorite among the baseball writers voting after putting up such dominant numbers over the last five years and having nothing to show for his efforts. Derrek Lee was awesome, but his Chicago Cubs stunk it up in 2005. Bartolo Colon (American League) - Even though he pulled up lame in the American League Division series for the Los Angeles Angeles, he was a horse all season long. Chris Carpenter (National League) - I think the St.Louis Cardinals' ace was the sentimental favorite among the baseball writers voting after the injuries he suffered [and worked to come back from] before putting together some pretty numbers for the Cardinals over the last two seasons. Huston Street (American League) - Oakland Athletics' star rookie established himself as one of the league's top young relievers in his first season in 2005. Ryan Howard (National League) - Suddenly I think it is going to be hard for the Philadelphia Phillies to justify trading Howard with him taking home the Rookie of the Year award. He may have more trade value, but there is a little more buzz to his name now. He isn't some other good, young player that maybe expendable. What happens between him and Jim Thome in 2006? I want to look at the items I've collected, display them and with the particular cards I've collected - get them autographed as opposed to just cram them somewhere to get out of the way. Ideally I want cards that I pick up for my collection to have a purpose. I make it a point to spend my money to pick up cards and non-card memorabilia items. I should make it a habit to learn how to enjoy them instead of moving onto the next fad. A Ebay winning finally arrived in the form of a 1973 Kellogg's Al Kaline. It is probably worth what I paid for it [$1.52 and a SASE on Ebay]. While it isn't worth much, it has the novelty of being a 32 year old card - making it sorta, kinda of an antique - I just hope for my sake, it isn't trimmed. Maybe I'll send it for a possible autograph request. 2004 Upper Deck II ($1.49) - lame Jason Giambi insert, lame Roger Clemens [checklist] - the best card as far as I was concerned was a Gil Meche base card worth half a nickel - you can see a blurred Ichiro cameo in the background. 2005 Topps Fan Favorites ($2.99) - Cal Ripken Jr. base card - but also cards of luminaries such as Jerome Walton [1989 National League Rookie of the Year], Jeff Brantley [ESPN], Ron Blomberg [first ever designated hitter], Jim Leyritz [New York Yankees] and Joaquin Andujar - I wouldn't want to pull these guys' [except for Ripken Jr. perhaps] cards during the time they played, why would I want to now? 2005 Topps Basketball ($1.99) - ugh, why did I pick up this pack of shiite? 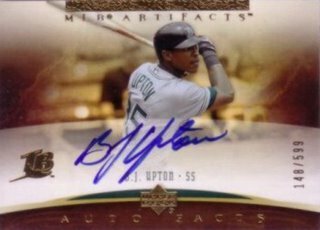 2005 Bowman's Best ($19.99 for a blister pack of two) - my auto [guaranteed in the blister marking] was a John Barratt with a 'notch' on the autograph sticker, numbered 422/974. Briefly looking at his stats on baseballamerica.com, it looks like he was beaten up in the Cal League in 2005. I know if I just wanted 'some cards,' I could do things a little better than waste my time and energy on retail packs. I feel so violated - but it is like, I'm the one who succumbed to the crap. This is where I really hurt my collections. How much am I going to pay for certified autographs cards of today's breakout stars including Travis Hafner, Adam Dunn, Miguel Cabrera, Jason Bay, Bobby Crosby, Johan Santana, David Wright, et al. What casual speculations can I make about these 'young stars' and where they will end up in their careers, so that I can evaluate their personal value? Except for probably for Dunn, Cabrera, Wright and Santana, the other guys are not young enough to get an opportunity to put up milestone numbers or at least be on a Hall of Fame track. On the other hand, these guys are pretty good young players and if they stay healthy, they will enjoy relatively long careers. In 10 years, will be I be happy that I bought a Santana certified autograph? How many wins will I assume he accumulates, so that I don't feel like such a dolt for buying to the hype right now? What if my sure things flame out? Will their certified autographs be worth anything then? On the side, how much am I willing to pay for certified autographs of past and present superstars? I want to collect items that have some long term mainstream value, even if I’m only truly collecting for myself. There is an idea to add 'instant bling' cards to my collection and picking certified autographs of superstars will add instant value to brag about perhaps. Instead of gambling on picking up unopened boxes of cards, there is always satisfaction in getting the card I want, instead of being one of the people who would rather bust a box, than pick up single cards. 2.) 2005 Upper Deck Sweet Spot Albert Pujols auto - I have the opportunity, why not pick a nice certified autograph card of his? 4.) 2005 Prime Cuts III Biography Willie Mays auto - his autographs on these nice cards look like a signature instead of an autograph signed [on a cut material?]. 5.) 2005 Upper Deck Sweet Spot Mike Piazza auto - was a superstar, but career has slowed down to where he may have more time and may not be as elusive to sign for pay as far as card companies are concerned. 6.) Alex Rodriguez certified autograph - maybe baseball's Kobe Bryant and a guy whose autographs I always want for my collection, though I already have several. I'm always looking for nicer ARod autographs, though on cards it maybe good enough to see him slack off on the quality as long as it is certified by a card company. 7.) 2005 Upper Deck Sweet Spot Mike Schmidt auto - $35-40 for the best looking certified autograph cards in the planet, though I'd rather pick up a single-signed baseball for about twice as much. 10.) Eli Manning certified autograph - 2005 Upper Deck Portraits 8x10; maybe get into his bandwagon as a future star. 12.) Michael Vick certified autograph - 8x10 or mini-helmet; one great injury away from being mediocre perhaps - but still a young rising star. I think I have to temper my enthusiasm for picking up certified autograph cards of Bryant, James, Pujols, Rodriguez and Jeter. These players are still in their prime, but have signed so many cards already. They will likely continue to have deals with card companies, where they sign newer cards. Each new trading card product is the opportunity for the release of certified autograph card featuring these players. Barring some kind of individual dominance [coupled with a dynasty - Bryant and Jeter not included], there will be more opportunities to pick up certified autographs of these players, where the values won't shoot up. Also, if I have to spend $100-$200 on an autograph of a current superstar, I would much rather try and find something that is not a card. Maybe that isn't possible, but this is where the autograph collector in me shows up and not necessarily the trading card collector. More and more certified autographs are on stickers and not on the actual card. I typically prefer autographs signed on the actual card, unless it is on a unique cut material [or just a white surface as opposed to a holographic sticker or clear cut label]. I'd rather much have something like a baseball, mini-helmet or an 8x10, rather than what would be an oddball size autograph item with regard to how much I might be willing to spend. HOF icons - players etched in history and in the lore of baseball - Hank Aaron, Mickey Mantle, Sandy Koufax, Babe Ruth, et al. Exclusive clubs - players etched in history, belonging to exclusive numerical clubs -George Brett, Eddie Murray, et al. HOF legends - guys who made their mark on the game and enshrined to the Hall of Fame because of it. Future HOF icons/legends - already have established their credentials as retired players or are still active players towards the end of their careers. Superstars - players that are at the height of their popularity - Vladimir Guerrero, Derek Jeter, Manny Ramirez and Alex Rodriguez. Some players deemed superstars do not have the statistics (or particularly) or the longevity to ascend to being future HOF icons/legends, but it can be said that in the prime, they were at the top of the heap. Award Winners - players etched in history as having individual seasons worthy of the MVP, Cy Young or Rookie of the Year awards. Rising Stars and Prospects - typically regional players from my home team and top prospects everyone is bound to know. Semi/minor stars - regional favorites from my home team as well as selected other players who have starred in Major League Baseball for 10-15 seasons. I'm looking for certified autographs of the two players. I'm not even a casual NBA fan, but these are the two initial guys I'd pay to watch [or pay to pick up their autographs]. What is clear to me is his killer instinct on the court and as a casual fan the fact that when I see number '8' on the court, sticking it to some other team - nothing else matters. What happened in Colorado and the chain of events that tarnished his image as a golden child [the breakup of the Los Angeles Lakers] isn't something to scoff at. On the other hand, as unpopular as Kobe supposed to be, as many fans boo him - he is really, really good and he is going to go down fighting, not be denied. I'd like to get a certified autograph of his before he truly hits his prime and hope he is the focal point of a dynasty. A Hank Aaron Upper Deck Authenticated autograph baseball arrived quickly after I sent out payment last Saturday - for less than a pack of 2005 Prime Cuts III would cost or a box of super premium cards - I got an UDA certified autograph baseball of the current home run king. I inspected the ball quickly and there is a special logo, featuring an inscription that is a little worn off. The autograph isn't as bold as it would ideally. On the other hand, I've needed an Aaron autograph for my collection and it is 'in-hand' as I type. *Also a 2005 Upper Deck Sweet Spot Signatures Paul Molitor auto arrived in the mail -it was truly more of an impulsive purchase. It took a while to get this card because of logistics. While he is a Hall of Famer, he already has other Sweet Spot auto releases, which saps the value of his latest Sweet Spot autograph insert. Still, he has over 3,000 hits and is considered the greatest designated hitter of all time - sorry Edgar Martinez. Late at night after I picked this card up on Ebay, I watched Beyond the Glory on the DH and it was cool he was featured prominently for his accomplishments at the position. This autograph was signed in black ink, which is kind of a negative, it is still a nice complementary addition to my personal Hall of Fame collection. My goal is to have some quality when it counts and have some quantity for fun. My fear is going around in circles as far collecting baseball cards or collecting signed non-card memorabilia. I like all sorts of different cards valued from $1 to $100. Maybe I'm riding through fads that have no substance [or at least will leave me high and dry as far as value is concerned]. I want to have a definitive purpose, so I'm not sabotaging my efforts to pick up the next piece of item that is going to be in my collection. Many times, I like a little bit of everything and I'm swayed by delusions of grandeur, instead of reality that I may not be able to collect everything. I want to be able to account for every single card in my collection as a group, whether or not they are worth a nickel or a $100. I am looking for definition to my collection, as far as what I can classify as valuable and what I can classify as more for the 'true art' of collecting. 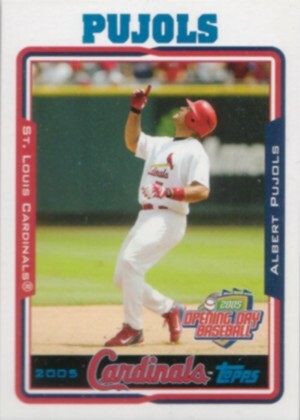 My philosophy maybe is to typically have no modern 'bling, bling' cards in my collection, which I would likely see as the lowest serial numbered, super-duper refractor autograph rookie year parallel/rookie card of an unproven prospect [or legitimate star like Albert Pujols]. At this point, there is no way for me to get in that game of prospecting. I prefer looking for a particular player's representative [if not definitive] rookie card graded PSA/BGS '9' condition. Each month, I'd like to secure at least one rookie card of players from 1980-1999 and dabble in perhaps picking up rookie cards of prospects I like from the last five years [maybe the most common/or second most common versions; autographed if possible]. I need to look for 'solid value' purchases, where I'm getting something I like, but not spending willy-nilly. Every month should be an opportunity to add a signed baseball, photo or a signed mini-helmet. It would be great, if I got a game used jersey, bat, et al - but basically I want a keepsake that displays well and features an authentic autograph by an Hall of Fame icon, member of an exclusive statistical club, current superstar or rising star. I hope to get the guys I typically haven't gotten otherwise [for free]. 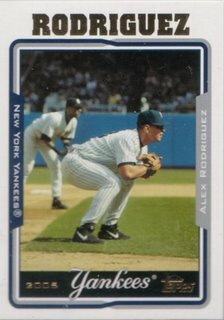 What I would want is kind of a set of cards to flip through at the most basic level, with a showcase of various prominent Yankees players over the years, featuring the cards I've collected. It is a type of collection, where a little bit of everything is needed to make this possible, if only on a small scale. I think it would interesting what I could come up with my current collection and what I could add on the cheap. The core of the collection would be base cards, but also certified autographs, material cards, retro cards, et al. I don't particularly care about value, just a visual representation of the organization that has won 26 championships. I think baseball cards should be displayed. Maybe with so many other cards, I should make an effort to a display and showcase the more aesthetically pleasing (if not particularly) valuable cards; maybe jersey and patch cards displayed along with photographs and/or other items in a particular theme to have fun with what I've collected. 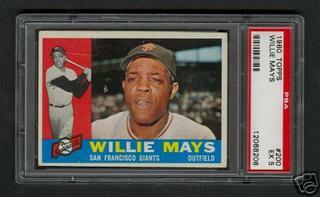 A 1960 Topps Willie Mays PSA 5 finally arrived in the mail- I won it in on Sept. 28 but held off on paying it until about two weeks later. I figure when you consider buying a low-end box or half a box of a premium baseball card product, then I'd rather have the Mays. On the other hand, 'just to have the card' isn't a good enough reason to pick it up. The surface of this particular card has some paper loss. I suppose this is a collectible card, though not something that would likely be considered by serious collectors. If it is the novelty of images that you want, why bother with low-end vintage star cards, when you have modern cards featuring Hall of Famers of the '60s, '70s, et al. Don't bother with having something just for the heck of it. 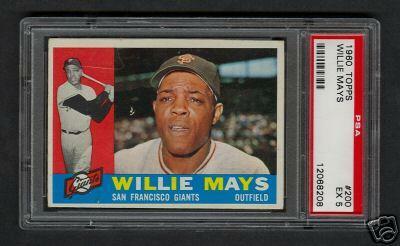 If you want to have a Willie Mays card, get a modern retro card of Mays for several dollars and spend the money you will have saved on something that has been signed, something that isn't beaten up and maybe something that adds to your collection. Nostalgia is for the birds. At times, I think I want everything under the sun and I’m afraid that I’ll implode because I think I have so many interests, yet don’t have the means to pursue each seriously. I’m afraid that I’ll be accumulating stuff as opposed to adding items to my collection. I’m afraid that that I’ll overlook important details that will be lost in the fever to pick more stuff up. As modern collectors, a discerning eye for what one purchases is important because purchases today maybe tomorrow's trash. One might be collecting for fun, but in 10-15 years, you don't want your collection to be worthless, especially if you put in a good amount of time and effort building it up today. This isn't about collecting whatever you want for fun. It probably wouldn't hurt me to pick up a box of 1988 Donruss in order to go through it for fun, even though the brand is worthless. On the other hand, not every product that comes out is going to be valuable, even in the near future. 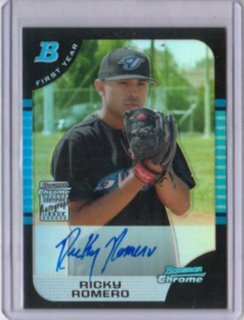 You don't have to buy a case of something, not every single card you see is worth picking up, not every prospect with a nice rookie year parallel autograph card is going to have a long and productive career. Temper your enthusiasm to believe the hype. Also specialization in collecting anything is important. You don't exactly want to be collecting many things, but don't have one special subject to focus on. Also, collecting can be a complicated process because you have to familiarize yourself with many terms and levels of collecting lingo that basically have to do with your collection's value. If one doesn't have the knowledge or just doesn't care, then you go about things and later on find that you've blown your wad on nothing of significance. Be aware of what you collect, so that you maybe picking up less things, but at the same time your collection has a bit more quality. I'm ambivalent over buying unopened boxes. It is a hit and miss gamble. It becomes impractical if I don't pull anything of significance [out of a box] like I would expect. With some money, I picked up a box of Zenith last Saturday at the bi-weekly cards show for $48. 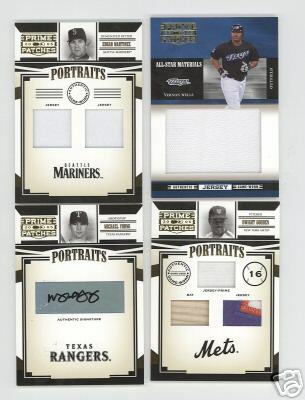 Museum collection (1:3) - Rocco Baldelli, Roger Clemens, Greg Maddux, Nolan Ryan, Grady Sizemore and Dmitri Young. Gold AP (#'d 50) - Mike Young #'d 36/50 - damaged! Z-Team (1:11) - Mark Mulder, Albert Pujols - damaged! Mozaics (1:8) - Arizona Diamondbacks (Shawn Green, Troy Glaus and Luis Gonzalez) and Seattle Mariners (Adrian Beltre, Jeremy Reed and Richie Sexson). White Hot (1:65) - Ted Williams - damaged! Epix - Pat Burrell (117/350), Hideki Matsui (089/250), Scott Rolen (166/250) and Nolan Ryan (190/250). Auto/GU - Dale Murphy auto (098/100), Cal Ripken Jr. bat/patch (04/25) and Bernie Williams jersey. Summary: The three nice insert cards (Gold AP, Z-Team and White Hot) being damaged 'fresh out of the pack' was a bummer, but the Cal Ripken Jr. bat/patch #'d to 25 made this break a keeper. Overall, the base cards decent and the base card parallels are nice to look at. On the other hand, I don't really like the multiplayer insert cards (Mozaics, Positions) nor truly captivated by much of the non-parallel inserts (Z-Team and Epix). A card that has arrived in my mailbox is a 2005 Upper Deck Sweet Spot David Wright - this is a nice card because this is Wright's first Sweet Spot autograph (on baseball leather). 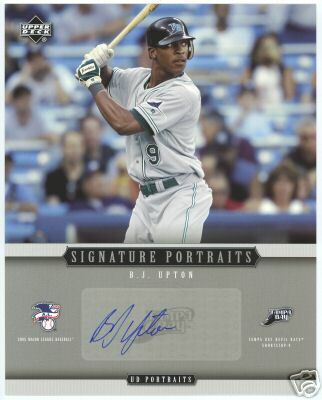 I really like the design of the Sweet Spot autograph inserts and was looking for another young star's certified autograph to be included in the set. Among hitters, Miguel Cabrera, Adam Dunn, Delmon Young, Rickie Weeks, Mark Teixeira, Victor Martinez are prospects/rising stars whose certified autographs (not exactly Sweet Spot autographs) I've picked up for my collection already (albeit second or third year certified autographs). The Wright is another name to add to this personal collection of players I think are going to be real good over the next 10-15 years. 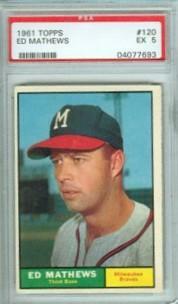 My 1961 Topps PSA-5 Ed Mathews finally arrived that I purchased from Ebay. 44 years ago, the Mathews card maybe have been equivalent to a 2005 Topps Eric Chavez card today that is a little worn, a little off-center but has been graded. 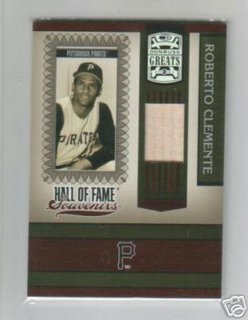 On the other hand, for $8.50 shipped, how can I go wrong with this card featuring a Hall of Fame member and 500 home run club member? $8.50 doesn't buy you a pack of 2005 Upper Deck Sweet Spot. It is like having an honest-to-goodness antique 'relic' from 1961 in my grasp. The card may not featured an autograph or a piece of a bat or comparable 'game-used' material but I feel like I can have a vintage card in-hand (even in a slab) and sense the history packed into it just by looking at it. I'm awaiting my purchase of the year so far, a Mickey Mantle PSA/DNA authenticated and slabbed cut. It was a stroke of luck to be able to find this item for my personal collection. I'm excited because it represents a stepping stone to a possible Hall of Fame autograph collection. PSA/DNA cuts i.e. 3x5's, Hall of Fame postcards, oddball sized cards maybe the way to build a collection of many (deceased) HOFers and other legendary stars (not in the Hall of Fame). I'll try and sniff around for particular ones that maybe tougher to get than others, yet still relatively affordable. For players still living and probably deceased HOFers who were alive through the 90's and were able to sign a lot of things, I probably would prefer a single signed baseball because it displays better. The fad is now vintage - cards and autographs because while I'd like to bust a pack of 2005 Playoff Absolute ($40-$60) or a pack of Upper Deck HOFers ($100-$150), my conscience won't let me. Collecting vintage cards makes much more sense because for the most part, I'd rather know I'm getting something identifying to top my collection off as opposed to gambling on the random, speculative nature of modern cards. The challenge will be making the vintage 'emphasis' viable and sticking with it enough to have an expertise. I'm cheap, but if I can, I'll go after an item if I think it is worth it. Collecting vintage isn't something for guys who aren't willing to spend $5 on a random pack of modern cards. Autographs are my priority always. Yet, I want a vintage card of an icon: Mickey Mantle, Hank Aaron, Sandy Koufax, Roberto Clemente and Jackie Robinson among others. My [Jeff] Cirillo success isn't an oddity, but maybe unique. He signed two out of four cards, returning the other two unsigned (including my 2001 Fleer Tradition 'set' card). I noticed that there were two distinct dots on the unsigned cards. I don't think this was due to the fact that he stacked the cards together, causing the other cards to stain. I've heard rumors about players marking cards that they return, but do not sign, to see if you would 'double up' them up with the same card and make another request. In recent months, I had read Florida Marlins reliever Todd Jones' column on Yahoo! Sports about the deal with autographs from a player's point of view. His column details how players would make little marks on the cards they return (unsigned) to see if you do end up making that multiple request. I wonder if Cirillo took the time to dot the cards, so that he'd have a 'chuckle' in the remote instance I'd write to him with the same unsigned cards. 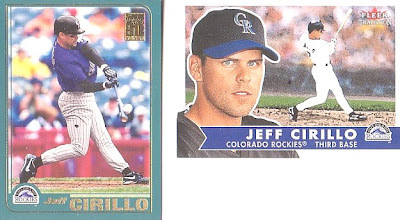 Of course, it isn't like I have other Cirillo cards in my collection I could send him, but most likely I would have sent the unsigned 2001 Fleer Tradition again (since that is the card I really want signed). Surprisingly, towards the end of June, I had SASEs (self addressed stamped envelopes) trickle in from baseball autograph requests I had made in previous months including Jack McDowell (6/30/05), Adam LaRoche, Hank Blalock (spring training) and Jeff Cirillo (spring training). It wasn't like I haven't gotten those players' autographs before, but my mailbox was empty as far as getting back requests before the last week or so of June. I don't even know if I keep track of my requests anymore, since I've otherwise just settled to do what I can in-person. Other successes mailed within the past month, included Curtis Granderson, Al Kaline and George Kell. I got a 'return to sender' from Cecil Fielder, whose autograph I once got on a trading card back in the day (1996). I discarded the card when an 'experiment' to remove some ink from the card stock failed. I haven't gotten a Fielder autograph since and hopefully, the address affixed on the 'RTS' label is a useful one. Accounting for autographs through scans – I want to showcase my most important autographs, even if not for web consumption. I figure, I’d start out this way, because I don’t want to showcase collection built around mostly autographs I’ve gotten by default. TTM, In-Person and Uncertified cards and other selected items. Novelties of my hobby – stories behind the stuff I’ve collected, maybe scans of unsigned cards, et al. With a budget of the A's Billy Beane has through his tenure with the A's, I can't aspire to be a truly serious baseball card, autograph or sports memorabilia collector. I'm collecting the most current of players, hanging on the most low-end, outdated ideals and it is a rigamarole of perpetual, adolescent collecting mediocrity. With that said, whatever I'll collect is for leisure. If I didn't like it, then I'd find something else to bury my head in. The point is that, I just don't want to get burned on the nickels and dimes I'd spend on my collectibles. I want to collect safely, I want to collect items that will maintain an established value. Things don't work that way, everything loses value, but I hope to look for items in my budget that will always be relatively popular. Collecting certified autographs of selected active and retired stars over the last 20 years maybe something I want to do. Players I'm looking at may be borderline HOFers or guys who just starred for their respective teams over much of their careers. I'm not looking to water down my collection, but I'm looking to view the last 20 years more reflectively and truly add some 'affordable depth' to my collection. Everyone has certain HOFers who have signed so many things, but some non HOF guys have been relatively tougher to get otherwise for the people who hound in-person or put requests in the mail. There maybe only a minority of collectors who understand that point and I'm hoping to take advantage for my own personal collection. My philosophy is Moneyball as far as collecting cards are concerned. Staying away from retail product is difficult, but I like think that I'd rather pick up something I consider as 'neat,' for that $10-$15 I'd spend for packs anywhere. I like rookie cards, but don't get involved in buying up rookie year parallels, I unless I pull one in a pack. I do not gamble with any boxes. I like stars, superstars, HOFers and other favorites. Vintage may as well be out of sight, out of mind though I believe it is important. I worry that I'm just a cursory collecting, but then I realize it is all for leisure. The caveat is that making sure that I need to gauge value accurately, so that I don't go bust. I don't want to spend too much on cards that have no real future value. I like lurking for other websites, devoted to my interests. I honestly, don't like looking at other people's stuff, because I tend to get jealous of collections that are out of my league. I like seeing more of the stuff showcased with a 'regional feel' and stuff, I can think about being ideal for my own collection. I do appreciate the efforts of other 'collectors' who can show off a handful of pictures, in a 'low tech' manner.